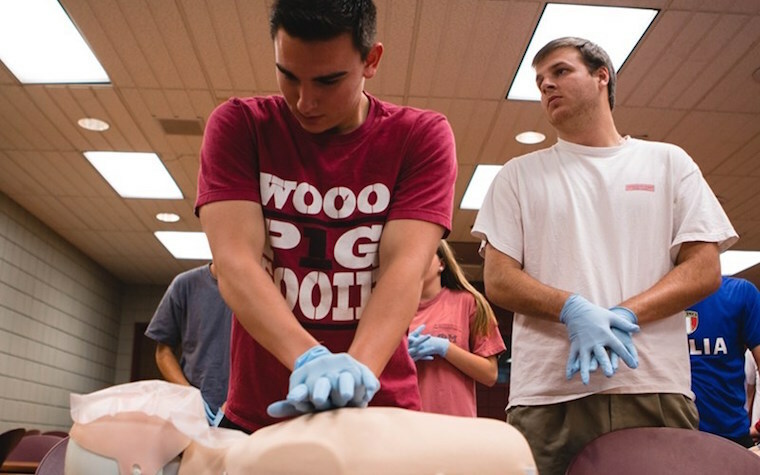 In honor of American Heart Month, University Recreation at the University of Arkansas will host CPR classes on Feb. 12 to teach when and how to perform hands-only CPR. According to the American Heart Association, as many as four out of five cardiac arrests happen n the home. Effective bystander CPR can double or triple a victim’s chance of survival, yet only one-third of cardiac arrest victims receive this kind of help. Barriers to act include uncertainty on how to perform CPR and the fear of doing things wrong and making the situation worse. Hands-only CPR training seeks to remove these barriers by educating people on basic techniques associated with CPR. This training should not be considered a substitute for certification or full CPR training, but having more citizens trained in CPR basics can help save lives. Classes begin at 11 a.m., noon, 1 p.m. and 2 p.m. Classes are free, with no registration required, and walk-in participants are welcome.